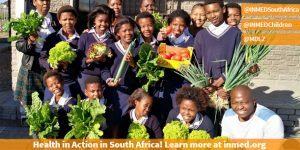 INMED’s aquaponic system at Nelson Mandela Metropolitan University (NMMU) is producing enough fresh vegetables and fish to supplement the meals of 20 disadvantaged schools in Port Elizabeth, South Africa. INMED installed the unit last spring in partnership with Mondelēz International Foundation as part of our Health in Action program to promote better nutrition and healthy lifestyles for school children, as well as nutritious menus, safe food handling and hygiene training for teachers, cafeteria workers, administrators and parents. The NMMU unit has been producing bountiful harvests since May.